After marijuana use was legalized in Colorado in 2012, ER visits linked to cannabis use tripled over the next five years at one of the state’s largest hospitals, according to a new analysis. Psychiatric ER visits were more common after people consumed marijuana edibles, compared to smoking or inhaling cannabis products. The researchers examined nearly 10,000 patients at UCHealth University of Colorado Hospital from 2012 to 2016, finding that while sales of edibles are lower than inhaled pot products, people eating marijuana candies or food were more likely to show up at the ER with severe panic attacks or other sudden mental disorders. Inhaled marijuana caused a higher rate of hospitalizations, mostly due to cannabinoid hyperemesis syndrome, a severe vomiting condition associated with heavy cannabis use. “About 10 percent of cannabis-related ED visits were associated with edible forms of weeds, but only 0.32 percent of total cannabis sales were for edible products. That’s 33 times higher than what we expected,” said Dr. Andrew Monte, lead author of the study and associate professor of emergency medicine and emergency toxicology at the University Of Colorado School Of Medicine. “Acute psychiatric visits like acute panic attacks, acute psychosis, and acute-on chronic conditions such as acute exacerbations of schizophrenia were also much more commonly associated with cannabis edibles,” said Monte. The study was published Monday in the Annals of Internal Medicine. Monte believes that people who consume marijuana edibles may be ingesting unsafe levels because they don’t feel the immediate high. The effect of edible cannabis products is typically not felt until 2 to 3 hours after ingesting, so ample time needs to be given before re-dosing with more of the drug, Monte added. 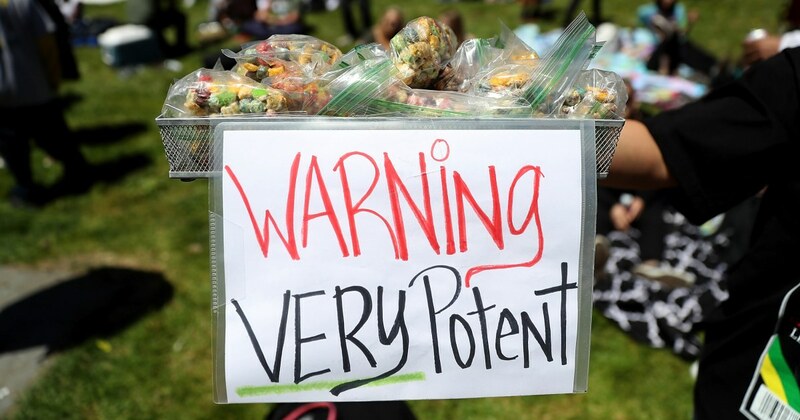 “So some users over-consume edible cannabis products, resulting in adverse effects,” he said. The market for cannabis edibles is growing. According to a report from Arcview Market Research and BDS Analytics, edibles spending in Canada and the United States topped $1 billion in 2017 and is projected to grow more than $4.1 billion by 2022. As the industry grows, more research needs to be done to see if edible marijuana use is a direct cause of negative psychiatric events, experts say. One of the major limitations of the study is that it is observational, meaning that it does not prove that use of marijuana edibles is the exact cause of psychosis or causes an exacerbation of psychiatric symptoms, or some other illness. Prior research indicates that people predisposed to psychosis or other psychiatric disorders may be at higher risk for adverse events following cannabis exposure, but doctors caution that claiming a cause-and-effect between marijuana use and onset of psychosis may be an exaggeration. “Studies such as these are unable to say whether it is the use of stronger forms of cannabis or edibles that is the cause of these patients having psychosis or other conditions that result in an emergency visit, but it also cannot be ruled out,” said Dr. Amir Englund, a post-doctoral researcher in Psychopharmacology, Institute of Psychiatry Psychology & Neuroscience, at King’s College London, who was not involved in the study. Another limitation is that the study only looked at one hospital, so it’s unclear whether this is a larger trend. Still, the concerns about marijuana’s link to psychiatric ER visits should be taken seriously, Monte says. The findings come on the heels of a study published last week citing that daily use of high potency marijuana may be linked to higher rates of psychosis. “Ultimately, we urge consumers to use cannabis in moderation, use low doses if unfamiliar with a product, and avoid riskier behaviors such as driving after using cannabis,” Monte told NBC News. Where have all the ‘for sale’ signs gone? October 5, 2018 Comments Off on Where have all the ‘for sale’ signs gone?